Ecuador, as its name implies, straddles the equator. When combined with the Galapagos Islands, this land of startling contrasts offers wildlife enthusiasts the ultimate holiday. There are some 1,650 bird species alone in an area the size of the UK. The staggering variety of terrain extends from the lush jungle of the Amazon Basin, across the desert-like paramo and perpetual snow-capped volcanoes of the high Andes, to the rocky marine paradise of the Galapagos archipelago. Ecuador is a large country with a varied terrain resulting in a variety of habitat for animal life. Nature lovers will thoroughly enjoy touring the natural areas of the country and spotting Ecuador’s wildlife species. The many nature reserves and national parks provide tourists with the ideal opportunity to spot mammals, birds, reptiles, amphibians, and insects. From aquatic creatures to terrestrial animals and arboreal specialists, Ecuador is a land of biodiversity. Should you be traveling through the Andes of Ecuador you stand a chance of spotting pudu, Andean fox, puma, spectacled bear, and mountain tapirs as well as various hummingbirds and the great Andean Condor. The mist-covered cloud forest regions of Ecuador are filled with bird species such as tanagers, hummingbirds, Long-wattled Umbrella birds, and plate-billed toucans. Mammals in the cloud forest are limited. Skulking through the undergrowth and climbing high in the trees, the Amazon Jungle is filled with wildlife. Reptiles abound and include large iguanas, colorful geckos, tortoises, lizards, the caiman, and massive anacondas. Mammals of Ecuador’s Amazon include river dolphins, jaguars, ocelots, monkeys, sloths, and anteaters. See how many of the enormous numbers of insects you can see. Inside the Amazon River are catfish, stingrays, piranhas, and eels. Traveling along the Pacific coast of Ecuador you may see lovely birds such as pelicans and frigate birds. The renowned Galapagos Islands boast a wide variety of wildlife. Reptiles are king here with Pacific green turtles, giant tortoises, and iguana species. The seas are home to fur seals, dolphins, whales, sharks, crustaceans, and rays. The Galapagos is also rich in bird life with frigates, boobies, albatrosses, cormorants, and Galapagos penguins. Having risen from the seabed as a result of submarine volcanic activity, and never having been connected to another landmass, the Galapagos Islands has a unique biological identity. Millions of years of isolation have given rise to species endemic to the islands through the process of natural selection. The absence of predators means that Galapagos wildlife shows little fear, and it’s possible to get surprisingly close to birds and animals without disturbing them – a dream for any photographer! Due to the ocean’s nutrient-rich currents, sealions, seals, dolphins, and whales are present throughout the archipelago. The many bird species include the finches that provided the clues that helped Darwin develop his Theory of Evolution. One of the most unusual and biggest terrestrial mammals in Ecuador is the Tapir. These shy creatures can weigh up to 300kg. Carnivores are always a favorite amongst tourists and Ecuador boasts 31 species. If you are lucky you may spot a magnificent Jaguar or even a hardy Puma. Primates always provide entertainment. Look out for Spider monkeys, Squirrel monkeys, and Woolly monkeys. The oceans are packed with animal life, such as manatees (sea cows), whales, and dolphins. Sadly, some of Ecuador’s wildlife faces an uncertain future. Species listed as critically endangered are the Spiny Rat Species and the endemic Galapagos Rice Rat. On the endangered list you will find the Mountain Tapir, Pacarana, Colombian Weasel, Blue Whale, Fin Whale, Giant Armadillo, Giant Otter, and a few others. 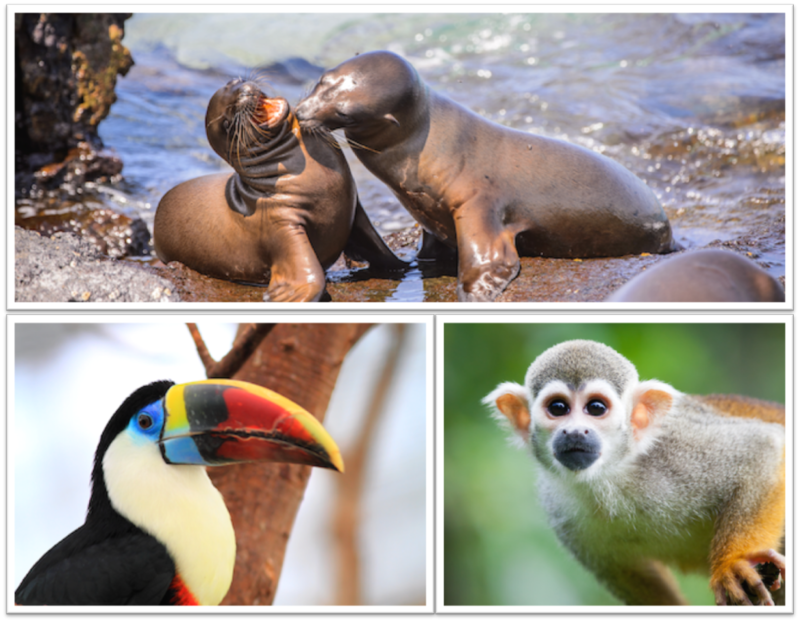 Vulnerable animals requiring protection include the Amazonian Manatee, Bush Dog, Boto or Amazon River Dolphin, Humpback Whale, various bats, Long-haired Spider Monkey, the endemic Galapagos Fur Seal, Giant Anteater and others.